We all would like to have a slim and healthy body. It’s attractive, helps us feel more confident, and increases our self-esteem. That’s why many people are ready to do their best to achieve desirable results. However, very often, despite all the efforts and changes in lifestyle, we still can’t get the body of our dream. For example, many people can’t get rid of their belly fat. It turned out that sometimes some of our habits stop us from getting desirable effect. Today we have prepared some important information for you. 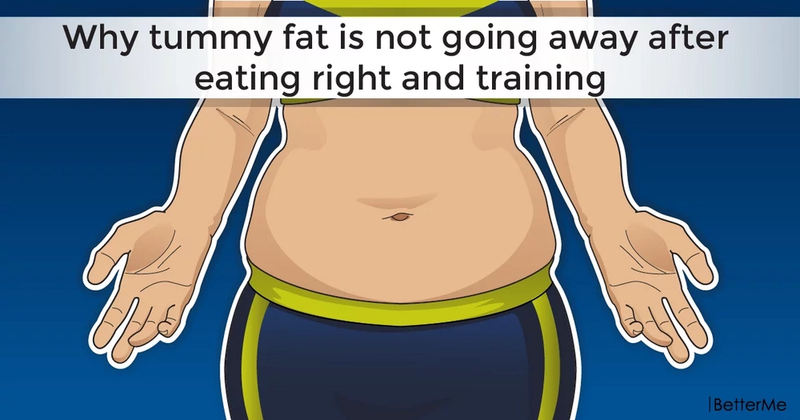 We will tell you why tummy fat is not going away after eating right and training. You’ll see that some really simple things stop you from becoming slimmer and healthier. Let’s start. Very often people underestimate the role of water in their lives. They don’t think that hydration is important, and it is a big mistake. Hydration is essential for the health of your hair and skin, weight loss, and overall health as well. People, who want to lose water and get rid of their belly fat, should pay special attention to the amounts of water they drink every day. Drinking water helps to reduce appetite and stops us from overeating. Hydration also helps your kidneys and liver work properly. You should also know that when you increase your fiber intake, you should also start drinking more water. If you don’t, it can lead to constipation. Water will improve your digestion and help to lose excess weight. People, who want to lose weight, should pay attention to their protein intake. This element is essential for them, since it not only helps to stay healthy, but also helps to gain and maintain muscle mass and stay full longer. In this way we can lose weight. Moreover, our body spends more energy to metabolize protein than any other element, that’s why it helps to burn a little bit more calories. So, you should include such foods as meat, fish, and dairy to your daily meal plan. Yes, it is important to exercise at least one hour per day. However, very often, people who do it, spend the rest of their day at the desk. One hour of physical activity won’t be effective, if you don’t move all day long. That’s why you should stand up from your chair and move during about 5 minutes every hour. You should also use stairs instead of elevator, get off the bus a couple of stops earlier, make small walks after the working day and stuff like that. Being active during the day will help you to lose your excess weight and stay healthy. Many people don’t control their portion size. However, it is a great way to lose weight. It is very important to determine how much food you should consume per day. You can use online calculator to determine your daily calorie intake. Then to this number you should also add the amounts of calories you burn during your exercise. As a result, you’ll get the amount of calories you can consume during the day without gaining weight. People, who want to lose weight, know that they should perform physical exercises on a regular basis. However, there are also some disadvantages of this system. For example, those, who exercise regularly, tend to eat more thinking that they have burned many calories and have earned some food. However, you should also know that when you train regularly, your body can start retaining water. In this way it wants to ensure that you won’t turn dehydrated. You’ll get rid of that water only if you become inactive. In order to solve the problem of water retention, you should drink enough water every day. We all know that stress is extremely harmful for our health. When people are under the stress, they tend to do things that cause excess weight gain. For example, stress stimulates our appetite and makes us overeat. As a rule, in such cases people eat something fatty, sugary, and fried. However, even if you don’t eat junk food, stress still stops you from losing weight. Cortisol, stress hormone, slows down our metabolic rate and causes formation of belly fat. So, as you can see, there are really simple things that stop you from slimming down. These mistakes are rather easy to correct. That’s why, if you can’t get rid of your belly fat, you shouldn’t give up. Just make some changes in your lifestyle, and you won’t wait long for the results.